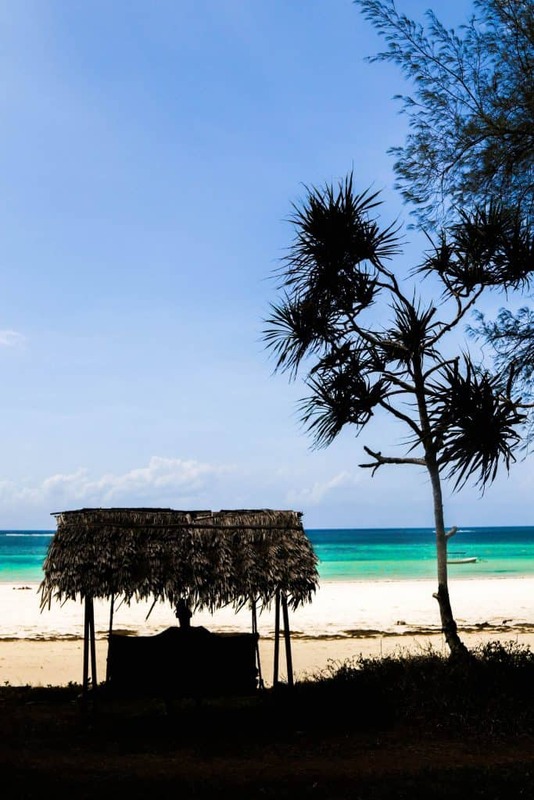 While most are familiar with the island of Zanzibar or Kenya’s coastal city of Mombasa; it’s likely only those who have visited Kenya know of Diani Beach. 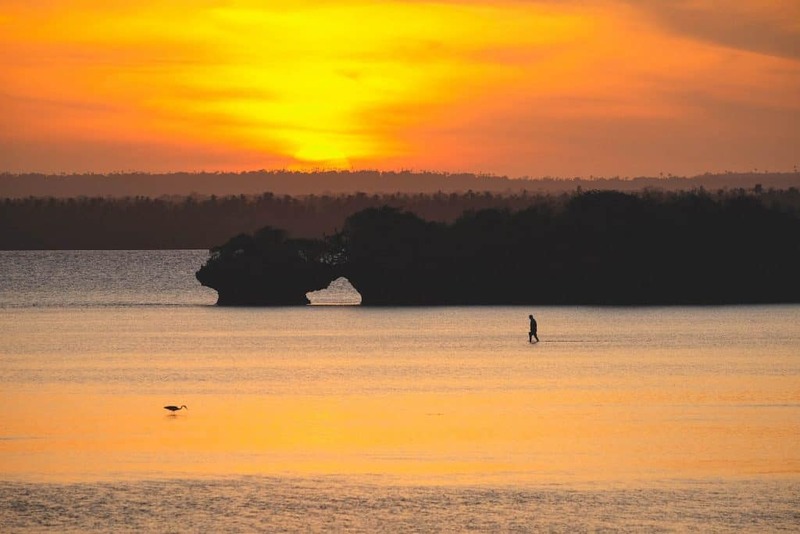 Just 30 km’s south of Mombasa is a 10 kilometer stretch of beautiful white sand. The town boasts a great coral reef, primates, Kinondo culture, a wide range of accommodation, and the warm Indian Ocean. We took to the Kenyan coast to uncover the best Diani Beach hotels. Kinondo Kwetu is a barefoot boutique paradise. 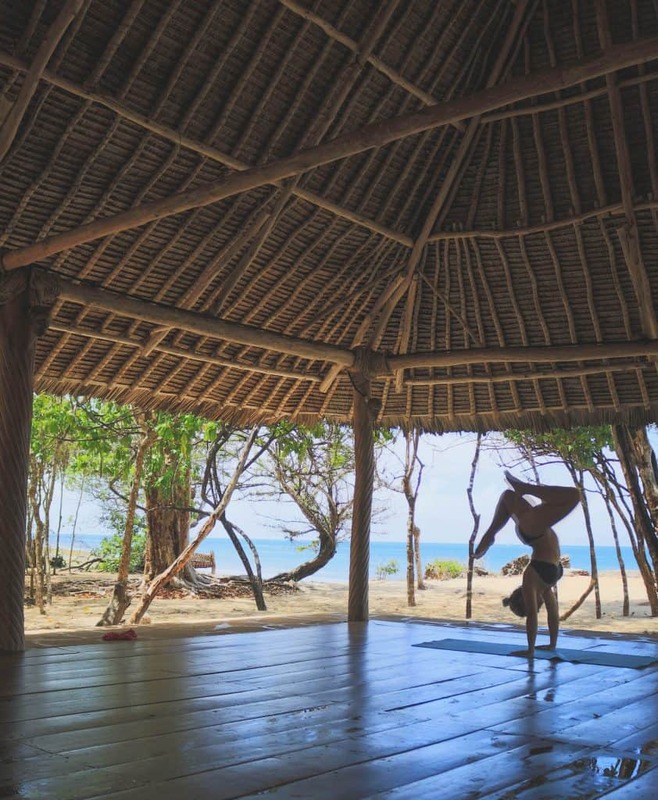 Here you’ll find healthy food, a gym, large lap pool, quiet beach, and an inviting atmosphere. Our time spent at Kinondo Kwetu was strictly no shoes (our own rules). The beach lodge is situated away from the busy strip of hotels on Diani Beach, instead it is just south of what is Kinondo Beach. The Bohemian lodge has received various accolades for its work in environmental sustainability and community development. That scores big for us as we’re always in search of to reduce our footprint through eco friendly products and businesses. This is driven by a young Swedish family who moved to Kenya over a decade ago to set up their lodge. 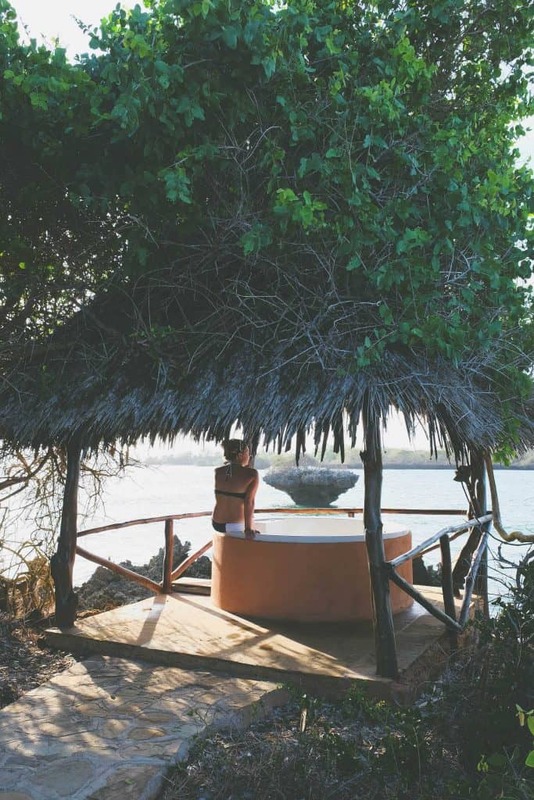 Since then it has grown from a handful of cottages to a secret escape for families and honeymooners on the Kenyan coast. Kinondu Kwetu has nine different types of rooms ranging from ocean facing rooms to family cottages. There are two pools – one for adults and one pool large enough to hold scuba diving lessons. The property is littered with sun beds, unique places to eat, and even a sauna for those crazy Scandinavians. They also have their own stable for guests that want to go horseback riding on the beach, many kayaks, and even a slack rope to practice your balance (Cameron never left this rope). We enjoyed relaxing next to the ocean during the day, getting active in the gym or with the activities, and then enjoying an evening in one of their two lounges with jazz music always on the radio. 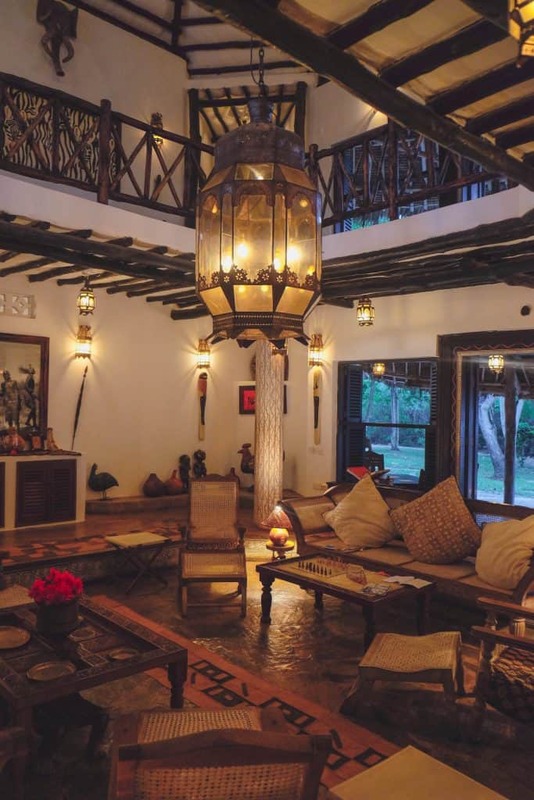 The lounges, as well as the rooms, are beautifully decorated and draw on themes from around the Kenyan coast. This new lodge has an old soul. All meals are included in the rate at Kinondo Kwetu and are usually seafood inspired. Most meals have focus on healthy ingredients with some dishes being made from scratch! We found the staff here are extremely well trained, attentive, and actually care about the comfort and happiness of their guests. 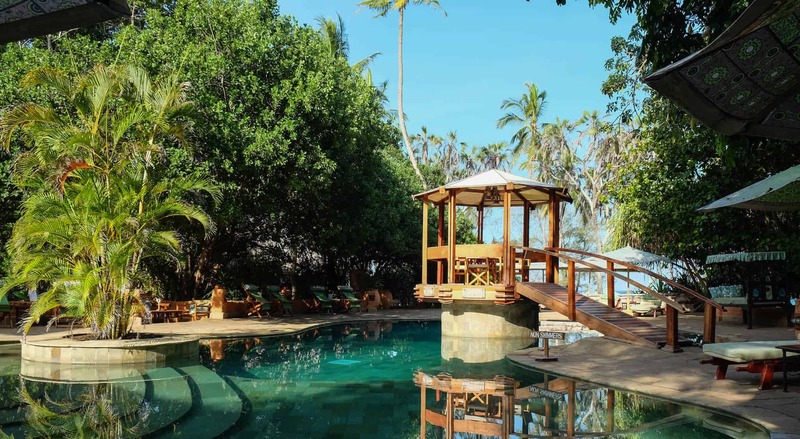 At more than $500 a night, Kinondo Kwetu is one of the more expensive properties on this list, but with the price, you get a personalized feel, excellent staff, privacy, and true relaxation near busy Diani Beach. This property is family run and is the perfect place for families or couples to come upon completion of their safari in Kenya. We left with the property being one of our favorites in all of Africa, don’t be surprised if this one makes our top lodges list in the future. What makes Kinondo Kwetu a best Diani Beach hotel? Personal family feeling, superb atmosphere, welcoming staff, general cleanliness, relaxation, and delicious healthy food. The Sands at Nomad is located on one of the main stretches of Diani Beach amongst much of the local life in the area. This resort is a medium-sized property good for getting to know people but retains some intimacy in their 26 acres of forest. The Sands at Nomad has 18 rooms ranging from basic double rooms to beach front cottages. 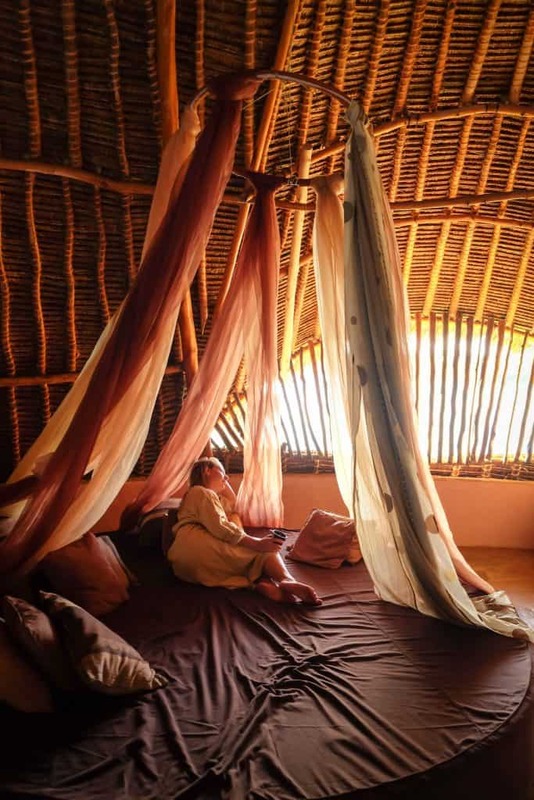 All of them feature air condition, WiFi, and a fridge which may not seem like much to some people; however, once you land on the Kenyan coast you may change your mind as the humidity is intense! 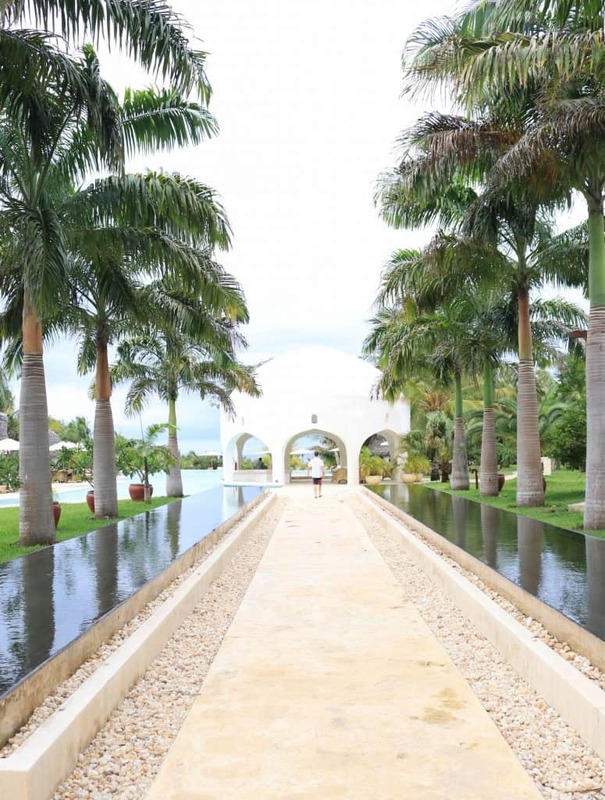 Stepping out of the rooms you’ll find the white sand beach or the pool, both are perfect for hot days. We found the staff, amenities, and location of The Sands at Nomad to all be ideal, but the real award goes to their restaurant.Nomad Restaurant is right on the resort property just steps away from all rooms. 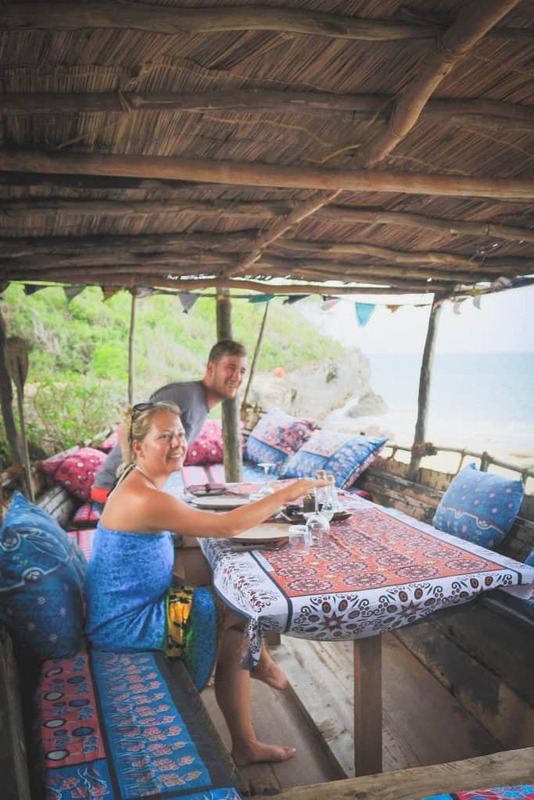 Nomad Restaurant has the idyllic beach front views complete with a bar, ice cream parlor, pizza oven, and even a sushi station. The restaurant is open to both resort goers and to the public. We had the half board option at The Sands which I would highly recommend. Each night half board guests are invited to order any three courses off the menu. We tried a mix of Japanese cuisine, seafood, and soups and all of them were delicious. Rates at The Sands start at $150 per night and go up from there based on room choice and food packages. The Sands is a good place to hang out with kids as well as a group of friends looking for a great time on Diani Beach. Why is Sands at Nomad one of the best Diani Beach hotels? The ala-carte restaurant, service, and room amenities like strong WiFi and air conditioning. If there is a mega resort on Diani Beach – Swahili Beach is it. 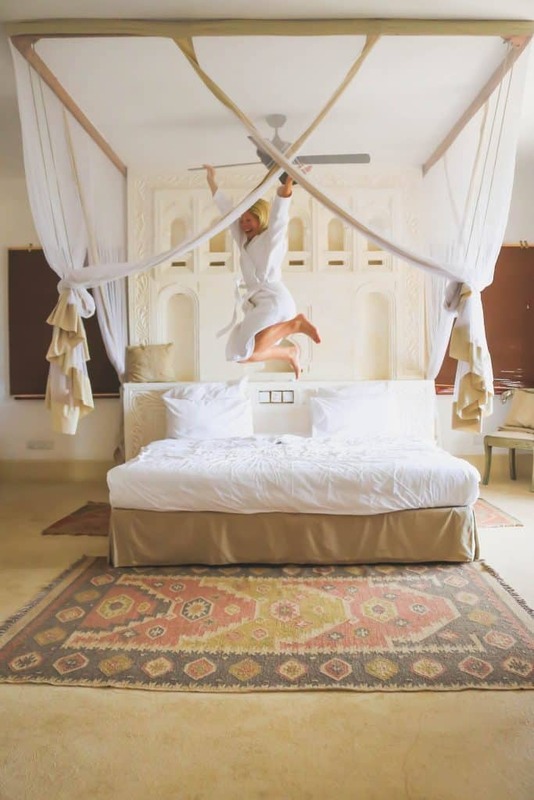 At Swahili Beach, bigger is better, and that’s exactly how you feel when you first walk through the large Arabic styled doors. Located right off the main road in Diani Beach, Swahili Beach was built with Arabic and Swahili architecture in mind. The decor and furnishings at Swahili Beach make you instantly feel as if you are in a Sultan’s palace centuries ago. 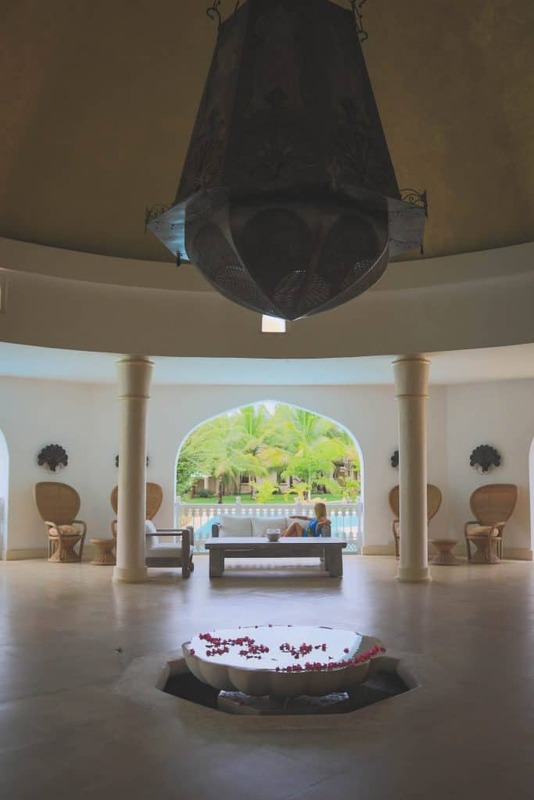 Swahili Beach features more than 60 rooms each comfortable and spacious. All rooms have their own balcony that overlooks the large pool, but I will get to that later. Swahili Beach mainly operates on a half board basis with most meals being served at a buffet style restaurant – Majilis. 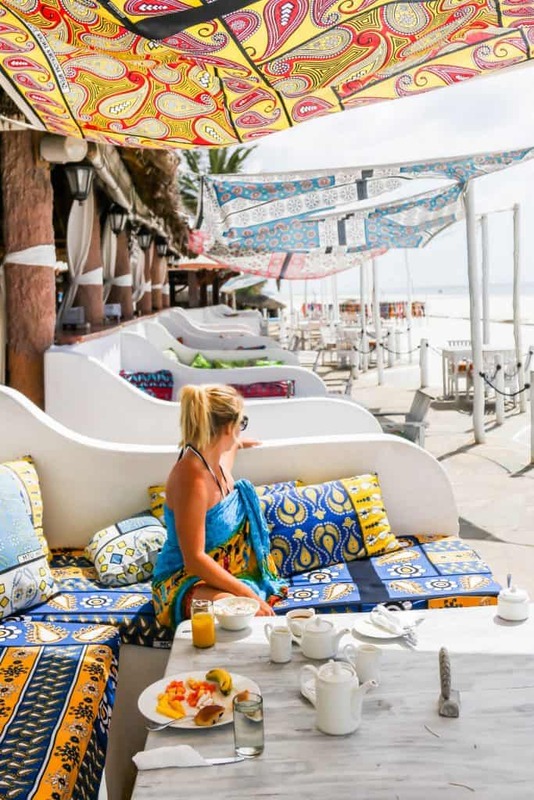 For those vacationers that want a bit more of a personalized dining experience, Swahili Beach has you covered with their four other restaurants and bars. There is even a main coffee shop where each day complimentary high tea is served with a collection of assorted cakes and fruits. 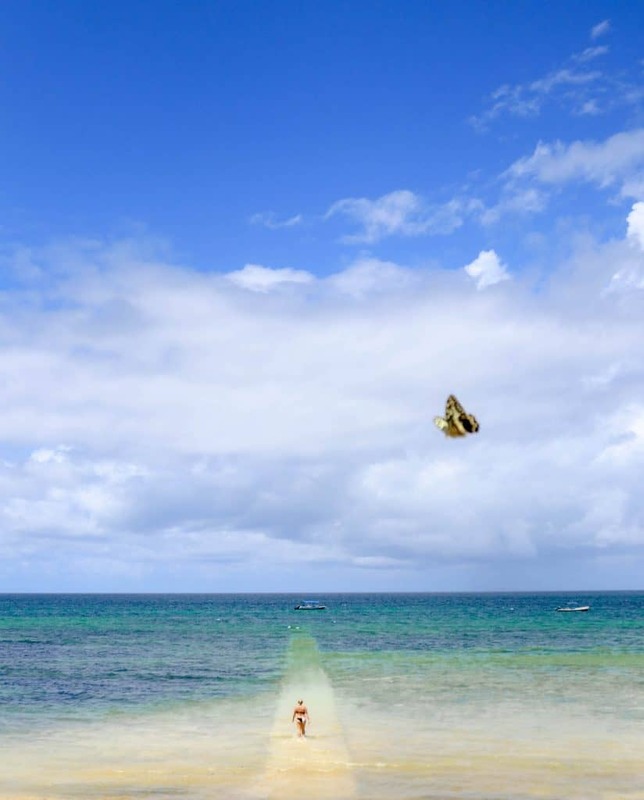 So what is there to do at this Diani Beach Resort? Well, there is a monstrous pool that probably beats out all the pools in Zanzibar for the largest I have ever seen. The pool literally cascades down a hill to the beachfront where guests can then walk out to the Indian Ocean and take in the views. Swahili Beach is another property on Diani Beach where the staff was friendly and helpful despite catering to such large groups of tourist. I’ve also been told that Swahili Beach hosts large pool parties and other events so we found it the perfect spot for a “friendscation.” Starting at $120 per night they have great rates specifically during special holidays when you can get packaged deals. Why is this one of the best Diani Beach Hotels? Cascading pool, friendly staff, price, large rooms, and Swahili inspired design. What if I told you that just off the Kenyan Coast, just a 600m walk away, is an island filled with magnificent birdlife, monkeys, and warm swimming in crystal water? Well, that’s exactly what you get at The Sands at Chale Island. The sister property to The Sands at Nomad. Chale Island operates completely independent from its mainland counterpart. Half of the island is a resort and the other half is a sacred protected forest. The beaches here aren’t littered with beach touts or hunks of seaweed. Instead, they are idyllic for swimming in a warm Indian Ocean paradise and are often frequented by sea turtles. Besides lounging on the beautiful beaches here guests can walk around the entire island at low tide, kayak, and wander among the mangroves. Another great thing to do here is sit in your private beach chairs and listen to the island birds while watching the cheeky colobus monkeys eat berries in front of you. There are a few different styles of rooms ranging from your standard room, to overwater suites, to one honeymoon banda. We were upgraded to the honeymoon banda which was the most private suite on the island. To say the honeymoon suite is huge is an understatement. With a private lounging area overlooking the ocean and an upstairs lounge, this place was bigger than our old New York apartment. The honeymoon suite was my favorite part of the stay because you could watch both sunrise and sunset all from the comfort of the room. There are a few pools for the folks that prefer to stay away from the sand, and a bar with live entertainment every night. We also enjoyed the fact that there was somewhat working WiFi throughout the island (seeing as we like to keep up with Instagram). It is important to remember that Chale Island is indeed an island and there is no electricity for the greater portion of the day. At night the property runs on generators. Chale Island even has it’s own time zone, which is set one hour ahead of the real Kenyan time. Personally, we hated the change in time zones as everything was one hour earlier than expected including breakfast, lunch, tea time, dinner, and checkout time. As long as you come prepared for no electricity, your own time zone, and a beach paradise you will love Chale Island. 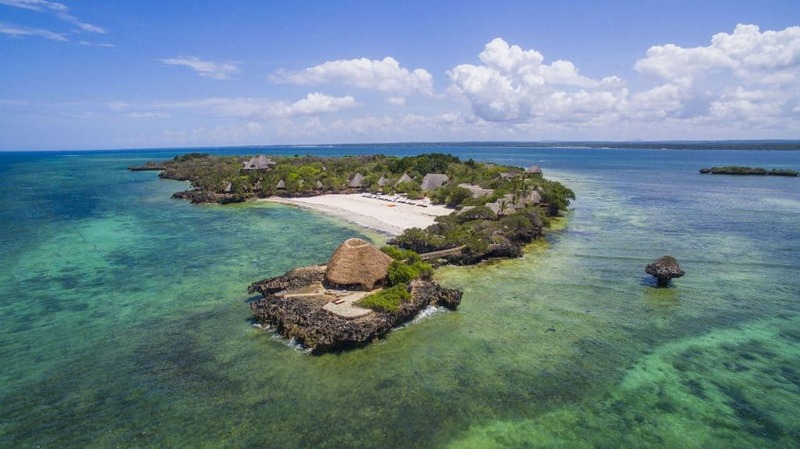 Chale Island is a best Diani Beach Hotel because… It’s an island! This resort is set on its own island so it’s hard not to love that! The privacy of the beach here also makes it the most beautiful we found near Diani Beach. Check out our beach packing list for ideas on what to pack! Mombasa is 30 km’s north of Diani Beach. The airport is small, but services flights from around Kenya and internationally. We flew to Diani Beach from Nairobi JKIA with Fly540, which is operated by Fly SAX, and had a pleasant experience with them. A cab ride from Mombasa to Diani Beach should cost no more than 4000 Kenyan Shillings but always agree on a price beforehand and put your bargaining cap on. If you want to go on safari in Kenya I can recommend Nairobi National Park for the city dwellers, and of course the famous Masai Mara for a classic safari experience. There is a ferry between Mombasa and Diani Beach. Time your ferry arrival time accordingly. We arrived on a Friday night and waited almost two hours to board the ferry with our car. Foot passengers should experience no delay. If you decide to call an Uber to Diani Beach be sure to take note of the ferry. The longer you wait to board the higher your Uber fare goes. Ukunda Airport is a small airport near Diani Beach. Only 3 km away from the main resorts. Local matatas, tuk-tuks, and taxi cabs are available for those that wish to explore. The most expensive will be a taxi cab. Always be sure to negotiate a price as the cabbies start insanely high, especially for Mzungus. Those looking for a wild party should head to Forty Thieves Beach Bar & Bistro for a fun night out. There is a Diani Beach Shopping Centre for any items you may have left at home. There is also a well stocked Nakumatt Grocery Store for those who wish to cook their own food. Be sure to check out the Kaya Kinondo Sacred Forest, which is near Kinondo Kwetu. The forest is culturally significant and still protected by the local Kinondo tribe. If you like Diani Beach, be sure to head to the island of Zanzibar or cross the border into Tanzania and get to Ushongo Beach! Flights to Mombasa: We flew to Mombasa with Fly SAX and had a great experience. Check flight times with them here. Water: If you want extra assurance then we love traveling with our Lifestraw Go Waterbottle. Adaptors: Kenya uses the three prong British plug. Make sure you have one for visiting! Guide Book: The internet in Africa isn’t always the greatest, that’s why we travel with a Lonely Planet guidebook for those wireless nights.